Due out in 2019 in Japan. The latest issue of Weekly Famitsu has the latest information on the newly announced Girls und Panzer: Dream Tank Match DX for Switch. As previously reported, the PlayStation 4 version will receive the new content from Girls und Panzer: Dream Tank Match DX (sans the local transmission battles) as paid downloadable content. Weekly Famitsu confirms it will cost 3,500 yen. A pack also including the currently available Nonnna and Erika character model add-ons will also be available for 3,800 yen. 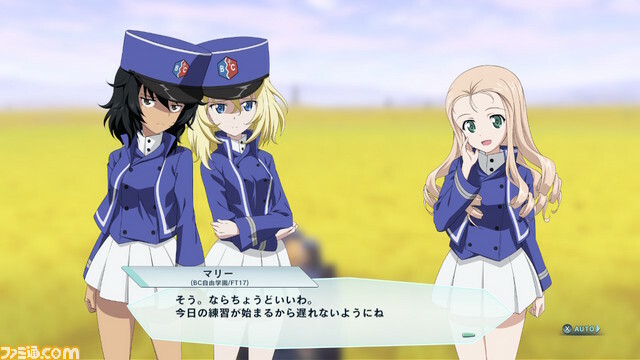 Girls und Panzer: Dream Tank Match DX is due out for Switch in 2019 in Japan. Girls und Panzer: Dream Tank Match is available now for PlayStation 4 in Japan and Southeast Asia. The Southeast Asian release features English subtitles.